From the Eneolithic to the Late Bronze Age vast areas of Eurasia were inhabited by a series of highly mobile and innovative groups that mostly relied on pastoralism for subsistence and, judging by their warlike grave goods, didn't mind a bit of biffo. In Europe, where they first appeared, their archeological remains are generally classified as part of the Corded Ware Culture (or its Battle-Axe and Single Grave offshoots), and in Asia, where they expanded rapidly from the Trans-Urals to the Pamirs and south Siberia, as part of the Sintashta, Petrovka and Andronovo cultures. It's likely that these groups had a profound impact on the Bronze Age world, including on Mycenaean Greece and Hittite Anatolia. The Sintashta Culture, for instance, is credited with the development of the spoked-wheel chariot, which became widely used in warfare all the way from Egypt to China. Unfortunately, a lot of nonsense has been written on this topic in the past. In my view, one of the most sensible and up do date sources currently online is the thesis The Origin and Spread of the War Chariot by Elias Manuel Morgado Pinheiro. Indeed, the obvious awesomeness of these ancient people has stirred much controversy about their origins and legacy. The academic consensus is that they were closely related, and that at least some of their ancestors were early Indo-Europeans from Eneolithic Eastern Europe. But a few archeologists have argued that the Corded Ware Culture was native to Central Europe, and others that the Sintashta population arrived in the Trans-Urals from Iran or even Syria. Moreover, linguists generally consider the Sintashta/Andronovo people as the most likely candidates for the Proto-Indo-Iranians, and thus the precursors of the Indo-Aryans. But this is contested by many Indologists, who prefer to see the deepest roots of the Indo-Iranians closer to India and often oppose the idea of an Aryan conquest of South Asia during the Bronze Age. In the near future, probably within the next couple of years, ancient genomics will leave very little room for debate in these matters and the arguments will cease, at least in mainstream academia. But we already have a reasonable collection of ancient DNA from the relevant archeological cultures. Does it back the general consensus? Let's take a look, starting with the Y-chromosome data sorted by culture. The bracketed numbers are the sample sources, which are listed at the bottom of the post. Corded Ware, Poland, RISE1 , R1b? Fascinating stuff. Keep in mind also that at higher resolution, most, if not all, of these R1a lineages are actually R1a1a1, which is estimated to be only around 5,000-6,000 years old based on full Y-Chromosome sequences. In other words, these groups were certainly closely related, and in large part the descendants of a patriarch who lived no earlier than the Middle or even Late Neolithic. Now, based on that list it might seem as if both R1a and Corded Ware were indeed native to North-Central Europe. But this is not so. R1a appears to be an Eastern Hunter-Gatherer (EHG) marker that in all likelihood failed to penetrate west of present-day Ukraine until the Late Neolithic, because it's missing in all the relevant samples before this period. So it probably first arrived in Central Europe with the Corded Ware people. We know that the Corded Ware people were foreign to Central Europe because their genome-wide genetic structure is starkly different from that of the Middle Neolithic farmers who lived there before them. This is easy to demonstrate. 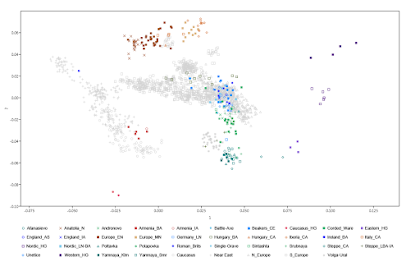 The Principal Component Analyses (PCA) below show where two ancient samples cluster alongside a variety of present-day West Eurasians from the Human Origins dataset . Note that Esperstedt_MN, a Middle Neolithic sample from a Baalberge Group burial in east-central Germany , looks more at home in Sardinia than Central Europe. On the other hand, the Corded Ware sample , also from east-central Germany, is sitting at the other end of the plot, among groups from the Volga-Ural region. I'll throw in a few more PCA featuring Corded Ware, Battle-Axe, Sintashta and Andronovo genomes that offered enough data to be placed on the plots with a high degree of accuracy . Note that the only clear outlier is RISE512, an Andronovo sample with an inflated level of East Eurasian admixture. If you're having trouble finding the ancient samples, download the PDF files and use the PDF search field. However, the meat and potatoes of ancient genomics are formal statistics. So in part 2 of this series I'll explore the genetic ancestry and legacy of the so called badasses of the Bronze Age using the ADMIXTOOLS software package. Update 28/04/2016: I'm gearing up to finally write the second part of the Badasses of the Bronze Age. But before I do that, I need to update the first part, because I now have two more sets of ancient samples that can be described as truly badass in the context of this series: Potapovka and Srubnaya. Incredibly, seven out of the eight Potapovka and Srubnaya males belong to R1a. One of the Potapovka individuals turned out P1, but that was only because of a lack of data, otherwise, in all likelihood, he'd also belong to R1a. Also, I recently changed the way I run PCA. Indeed, I can now accurately plot samples on a typical genetic map of West Eurasia with as little as 15K SNPs. So instead of a few plots featuring the best Potapovka and Srubnaya sequences separately, here's a plot with all of the badasses together. When exactly Slavicisation of East Germanic R1a people took place in Central Europe? According to many scholars, eastern parts of Germania were inhabited exclusively by Germanic-speaking people during the Iron Age, and since the 5th-6th century AD by the Slavs, who it seems did not arrive from the Eastern Europe/Asia, but are direct ancestors of Central Europeans (?!). If the Slavs show genetic continuity and no one arrived from the East, then what actually happened? It's so confusing...Any ideas, thoughts? Yeah, there's been a bunch of horseshit published on the topic and it'll take years to correct it with ancient genomics. The suggestion that Slavs arrived from Asia at ay point is comical. I see you have put a question mark to the second Battle-Axe individual. What is the reasoning? Was this a N-S burial? Rise98 is significantly closer to modern Scandinavians than Rise 94 interesting. Yeah, it looks to me as if the authors are hedging their bets about RISE98. They classify RISE94 as baCw and Battle-Axe in the supp info, but RISE98 gets baSca and Battle-Axe/Nordic LN. See supp info tables 1 and 9. Also, the fact that RISE98 is R1b-U106 and clusters in a different part of the plot than the R1a RISE94 is probably a hint that the Battle-Axe classification for the former doesn't fit. But maybe he's from a different Battle-Axe group? Dunno. Correct me if I'm wrong, but R1b-U106 (RISE98) found in Sweden suggests that Germanic Urheimat was somewhere in Scandinavia (perhaps Nordic Bronze Age culture)? It does suggest that. Based on this latest batch of ancient genomes all of the ingredients for the Proto-Germanics appear to have been in south Scandinavia during the Bronze Age. Davidski, he might be even from an another population because his burial and grave is not typical CWC/Battle Axe at all. Michal explained it here. Which population is he from if it's not either typical for Bell Beaker and Corded Ware? I'm not sure. There are a number of arguments against him being Bell Beaker as well. He's interesting though, because as you say, unlike the certified Battle-Axe RISE94, he looks like a modern Scandinavian on that plot, and he's R1b-U106 as well. So whatever he is, he's probably very important to Norse and Germanic ethnogenesis. You are right. I hope we will know more stuff about this mysterious population in the future. I am looking forward to the ADMIXTURE results of this R1b u106 guy. Anything interesting in the MtDNA of these "Badasses"? Yeah, this can be tricky. The difference between a Battle-Axe Swede and a Scottish Bell Beaker can depend on the local archaeological interpretations. Battle-Axe Swedes with daggers in N-S manner. They were all mixed regardless. An R1a from Corded Ware Germany has come out L664+ and an R1a from Denmark(during the era Corded Ware was there) has come out Z284+. Click on my "Vladimir Tagankin at YFull" source and you'll see there are even more downstream subclades these samples were positive for not listed at ISOGG. This is more confirmation that Corded Ware is the source of almost all R1a in Europe today. I won't be looking at the mtDNA because these were patrilineal groups who's maternal structure probably changed more than their Y-DNA and genome-wide DNA as they migrated. But here's a table with all of the mtDNA hg classifications from Allentoft et al. Not sure how deep they go? Eventhough I don't comment much these days, I am still following all the amazing new findings. I was just wondering, though, David, why do you post some stuff on here, and other on Eurogenes? Why not have everything on the same page? Also are you leaving the Yamnaya samples out of this storyline because they are too far East? Finally can we expect to see K7 and K8 runs of all of these ancient samples? I just like having a blog that deals specifically with Polish stuff and R1a. Some of these samples are available at GEDmatch and they can be analyzed with the K7 there. But I tried the K8 on them, and I suppose because of the low coverage and their basically haploid nature the results were a bit wobbly. What I might have to do is to overhaul the K8 so that it overlaps better with the Allentoft et al. dataset. But before that I'll run them in an unsupervised test, or maybe a series of tests from K9 to K12, as part of this badasses of the Bronze Age series. I should have the whole series wrapped up by this time next week. Very exciting, keep up the good work! Also, I'll try to make some maps (I am thinking of trying to make an animated map that follows the chronology for the main components) once there is a new K8 or any new unsupervised tests coming up. "Is there a compendium somewhere for all the GEDmatch IDs of the ancient samples?" Can you analysis RISE61. He's from Late Neolithic Denmark and had R1a-Z284. It'd be interesting if he was Corded Ware-like. RISE61 can pass for continental Corded Ware, but definitely late Corded Ware with local admixture. Is there information on the pigmentation frequencies of the Corded Ware? No David,Not Just Indologists but experts from other fields who have studied the Matter of Indo-Iranians closely enough and without any type of bias also agree that this Kurgan model for Indo-Iranians is a dud .